Nexus Revamped Pro has just been updated to version 1.1.15 and with that come lots of exciting new features as well as many bug fixes! Bug fix: Battery effects only started working once a battery update was given, now they work instantly! Bug Fix: Particle glow circle was truncated, now fixed! 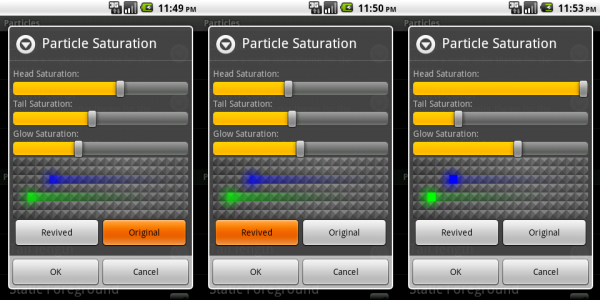 This is in addition to the other particle options (tail length and custom colors) you can now completely customise how the particles look with the new saturation settings. Some users disliked the change I made to more closely resemble the original design wallpaper by romainguy so I had added an option to choose between one like his particles (original) and like my previous particles (revived). I have improved the way in which bitmaps are used which should take up far less memory. This will likely prevent the OutOfMemory errors some people were getting and remove the change of a force close. I have tinkered with a few other things which should provide better performance. So the free version is a few versions behind the pro version and some of the fancier features are missing, I am constantly improving both so don’t worry if you don’t want to shell out £0.99 for an app. I have plans and ideas for the future of this application, please complete the poll below to indicate what you’d like to see in this app or leave feedback (comment) if you have any. What would you like to be added next to nexus revamped pro? Nothing, it's good enough already. Nothing, just move some of these options to the free version! Cant find this on the app store…shame really as it looks awsome! it would be sick if i could put this on my laptop! @macgreg I will look into adding an upgrade to pro paypal option into the free version with a keycode or something. In the mean time (as a reward for not pirating it) you can have a copy of the pro version for free (beta) if you send me an email (beta .at. stealthcopter.com). I’ve put a few things on slideme but due to their very low audience it isn’t economical for me to add paid stuff to it as I’d never reach the payout level. However if I build it into the program then it may become viable. i noticed all links and stuff, besides market links, dont work in your images are gone. could you please share the officespace.apk file? i want the icon and i cannnot find the apk on my phone. I checked /data/apps and it is not there. i even copied that folder to my computer and looked. couldnt find it. can you help? also i didnt know how to email you lol. you have it hidden somewhere. thanks!